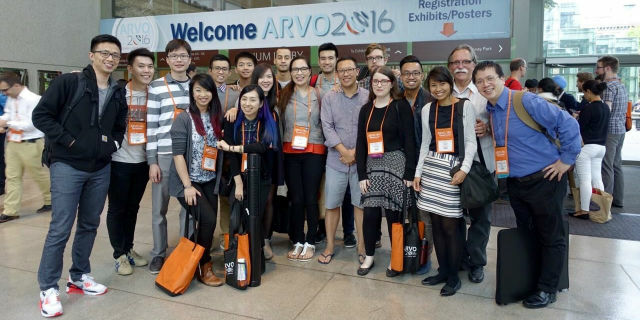 In May, a large contingent of DOVS staff and students attended the Association for Research in Vision and Ophthalmology (ARVO) annual conference in Seattle, Washington. ARVO is considered the major conference for eye and vision research internationally and attracts approximately 8000 delegates. Our staff and students presented a range of talks, posters, chaired sessions and discussed new collaborative initiatives with our international partners. Congratulations to PhD student Jeremiah Lim on winning the Optometry Victoria Postgraduate travel grant assisting his attendance at this event. The poster “Clinical validation of a tablet perimeter” by Algis Vingrys, Jessica Healey, Sheryl Liew, Veera Saharinen, Michael Tran, William Wu, and George Kong was selected by the Annual Meeting Program Committee as a "Hot Topic" representing the newest and most innovative research being conducted across all the specialties of ARVO. This distinction is awarded to just over 2% of all 2016 Annual Meeting abstracts at the Association for Research in Vision and Ophthalmology in Seattle, Washington, USA.Congratulations to the OD2 students who were involved in conducting the work reported in this poster.